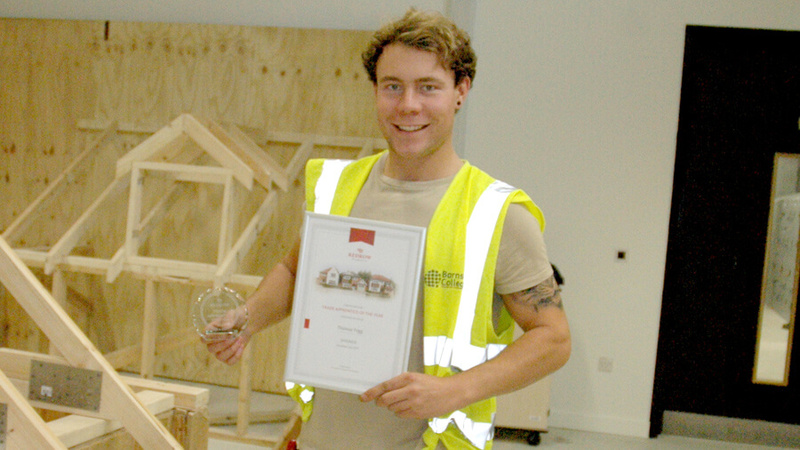 Joinery apprentice Tom Trigg is carving out his future by being named 2017 Apprentice of the Year for the Yorkshire region for Redrow Homes. Currently studying a Level 3 Joinery Apprenticeship at college, Tom won the top award due to his hard work, commitment and determination throughout his work with Redrow Homes and his studies. Tom, 20, from Wombwell, spends most of his time on-site helping to build new homes where he is being trained by West Yorkshire Joinery, a sub-contractor for Redrow Homes. He is gaining practical joinery skills at work which are being backed up by the theoretical knowledge he is learning at college.